Just how tired are you of playing poorly? There are so many teaching methods, so many theories and you probably have your own also. 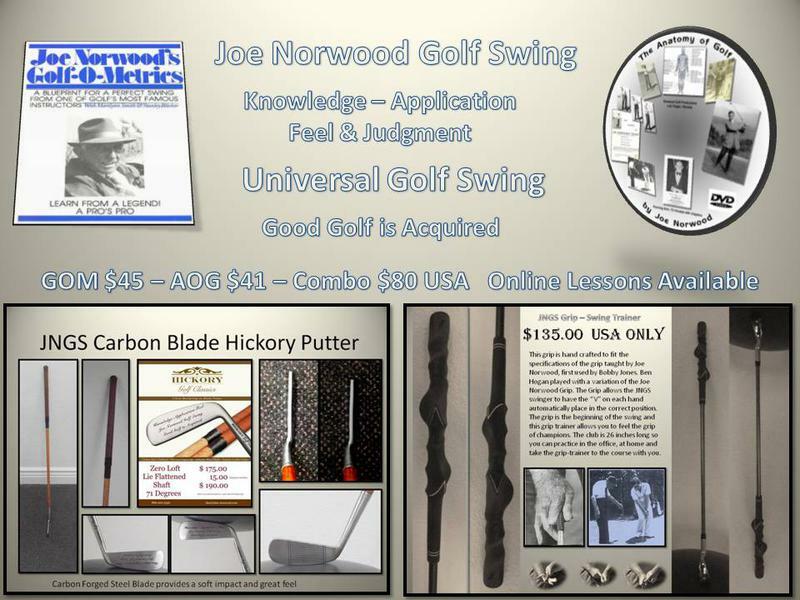 Striking a golf ball is not difficult once you learn a consistent repeatable method like the Joe Norwood Golf Swing. Joe Norwood spent his life developing a golf swing and enjoying helping others. I don't have the time to discuss golf swings with people who have no clue. My Grandfather gave this swing to me over 17 years. I've dissected it and teach it to serious golfers who want to play better golf. The swing is the most important aspect in golf. If you haven't got the swing then you can't play golf, you can try but you can't play. If you're serious about learning a swing that will stay with you the rest of your life. If you're serious about learning something about your body and how it works. If you want to have a string of holes that match the pros even though you're a weekend golfer. If you want the feel of that perfect strike and have the understanding as to how you did it. If you want to hit a golf ball straight on purpose. Then the Joe Norwood Golf Swing is here waiting for you. Invest a few bucks and some time and you'll find the straight path down the fairway. A perfect swing will not produce a perfect score but it will keep you in the fairway. If you can't develop a short game and consider hitting the ball long more important than sinking a 6 foot putt then for you to become a golfer who can actually play this game you need to change your attitude. Right now is a fantastic opportunity for the very small business owner. Money has been pouring into the Micro Small Business Arena since 2010 and it's designed to help the "MOM & POP" small business expand. Now you can fund your dream. 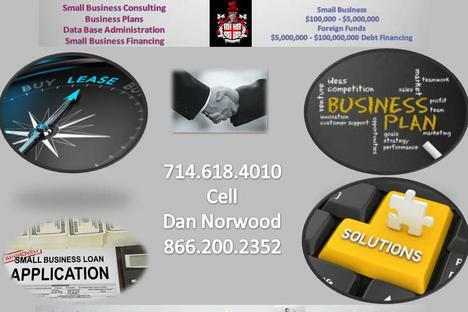 With 40 years of financing experience I can and will help you through the challenges of turning a struggling small business into a profitable small business, assist a small business in their expansion plans via an SBA loan or other type of small Business financing. Help you begin to fund your dream of being self sufficient.